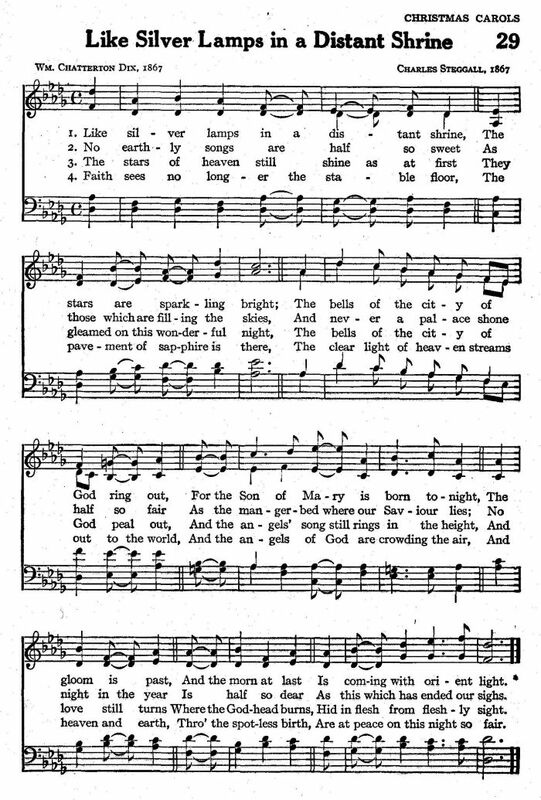 Source: William Chatterton Dix, Four Joyful Hymns for Christmas Tide (London: G. J. Palmer, circa 1865), #IV. p. 4. "Tomorrow ye shall have Help, saith the Lord God of Hosts." Is coming with orient light! As this, which has ended our sighs. Whom the prophets of God foretell ! And Love still turns where the Godhead burns. Are at peace on this night so fair! Sheet music by Charles Steggall from Henry Ramsden Bramley and John Stainer, Christmas Carols New and Old, First Series (London: Novello, Ewer & Co., circa 1871), Carol #2. Chope notes that verses 2, 3, and 5 begin on the second chord, i.e., at the beginning of the bar. Mono-syllables in italics (in the original score, above) should be sung to two notes, and dissyllables to one note or two notes slurred. This arrangement differs from that found in Hutchins, above. Also appeared in W. Chatterton Dix, ed., Christmas Carols & Christmas Customs (No publisher, location or date; ca. 1870).